Material: High quality soft PU leather ladies shoulder bags. SIZE: Medium size. L (38CM) * H (31CM) * W (13CM), 1 adjustable, detachable long strap. CAPACITY: Enough space for your wallets, cosmetics 3 "Macbook, iPhone and other daily items. Structure: Main compartment with zipper. Inside compartment with zipper, 2 open pockets, and 2 outside pockets with zipper. This handbag is suitable for travel, work, school, dating, shopping and gift. This bag is available for tote bag, handbag, shoulder bag, shoulder bags. 1. The bag with some odors from original materi, but it will be gone air in a few days. 2. Please allow 1-3 cm measurement error as the size is measured by hand. 3. The actual color of the bag maybe a little bit different because of the different screen of the display or the reflecting light. Material: Good quality PU leather, durable fabric lining. Golden metal parts. 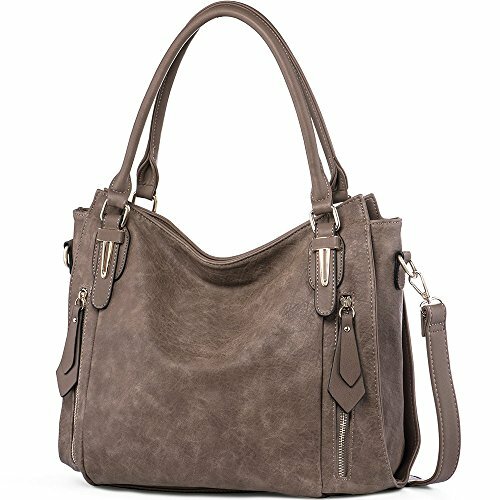 Structure: 1 zipper compartment divito this bag into 2 large spaces, 2 open pockets and a zipper back pocket inside, 1 back zipper pocket outside. Dimension: 12.99 inch * 5.11 inch * 12.2 inch (L * W * H), handle drop: 8.26IN. Multi-use: This handbag is suitable for many occasions such as woking, shopping, dating, etc. Zip closure.with a long strap available to change or remove. If you have any questions about this product by iYaffa, contact us by completing and submitting the form below. If you are looking for a specif part number, please include it with your message.